On my radio show last week, famous London based gold trader, Andrew Maguire was my main guest. The main topic of our discussion was Basel III Rules derived by the bankers bank, the Bank for International Settlement (BIS) located in Basel, Switzerland. The reason that is important is that those rules encourage banks to build up physical gold reserves rather than paper or unallocated gold reserves, in order to increase the quality of their capital base, in order to try to keep those banks from failing with the next financial crisis. With banks needing to own and hold physical gold rather than paper aka fake gold aka unallocated gold in their own coffers, Maguire suggested on my show that this development is super bullish for gold. 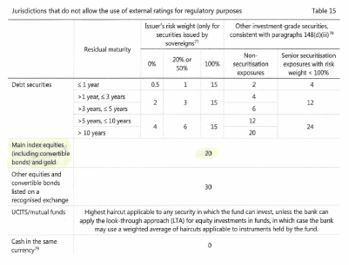 After my show I received an email from a very well-informed proprietor of a gold bullion and investment firm wanting to know if I could point him to the documentation of Basel III Rules. This person told me that he had spent a huge amount of time on the BIS website and could not find Basel III Rules. I was a bit humbled by this request because it reminded me of how easily I can engage in the same thing that has been happening at CNN and CNBC regarding Russian collusion allegations against President Trump. It is obvious to anyone who looks at those channels objectively that anchor after anchor at those networks have simply been parroting what they have heard others saying, what they preferred to believe, rather than conducting their own due diligence before declaring something to be true without ever searching for the truth. So I began earnestly seeking to find documentation to support the contention that fundamental accounting for gold on the books of the Too Big to Fail banks was not just a figment of gold bug imagination but in fact a reality. I did begin by searching the BIS website but, like my listener friend, was having a hard time documenting the new rules. Hi Jay For confirmation of the Basel III rule on gold, see https://www.bis.org/bcbs/publ/d424.pdf. 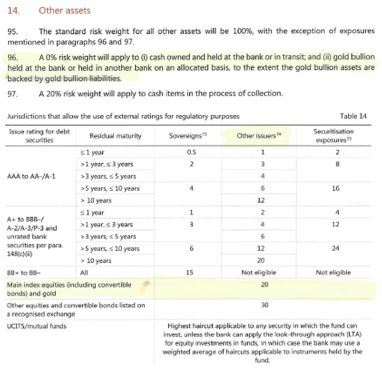 Paragraph 96 on page 28 clearly states physical gold net of liabilities has 0% risk weight for determining the bank’s capital, if it is held at the bank, or on an allocated basis (that is in physical form not unallocated paper contracts) at another bank. Where gold is held as collateral against a loan, a 20% haircut applies. See tables on page 41 and 42. Of course, as the table above on your right reveals, a lot of less worthy assets than gold, like main index equities including convertible bonds as well as other equities and convertible bonds listed on a recognized exchange, also qualify as zero risk or 100% reserve coverage. When the next stock market crash occurs, those “risk free” assets may become suspect to the establishment. But the desire to keep the paper game going, no doubt, is behind the Powell Pivot that we saw just recently. If the equity market began to decline dramatically, as started to happen before Powell’s pivot, the Basel III rule makers may be forced to recognize the superior nature of gold as a monetary asset. Of course, the ability of us humans to deceive ourselves never ceases to amaze me. It was Janet Yellen who just this last week suggested central banks should start buying equities! But let’s get to the potential direct impact of this new BIS ruling. As a wholesale gold dealer, Andrew claims to see the flows through major financial institutions. The Too Big to Fail banks, of which there are 20 such entities under the BIS internationally, are names like Goldman Sachs, J.P. Morgan, HSBC, Scotia Bank, Standard Chartered, and Deutsche Bank. Andrew told me that over the past 18 months these banks (which almost never lose in the gold markets) have been building up their physical gold reserves dramatically, which accounts for the very unusual occurrence of the banks having significant net long positions over that timeframe, while at the same time, speculators have had persistent net short positions, which is equally unusual. Again, keep in mind that the banks have an almost perfect trading record while being on net short most of the time. Their success is explained by their ability to wash and rinse speculators out of the unallocated or paper gold markets as demand on the long side subsides by massively shorting those markets with their endless monetary resources that they create out of thin air. With endless money, the Too Big to Fail banks can, by their sheer volume in the LBMA and Comex futures markets, control the direction of the paper gold market price. They can and do drive those paper markets down by piling on the short side of the market. Then when they exhaust all the speculative suckers out of the market, they can start to take long positions, which attracts speculative suckers back in for another round of “wash and rinse,” as Andrew referred to this activity. If you doubt this, it is well documented by a series of interviews I did here https://jaytaylormedia.com/manipulation/ with David Jensen a couple of years ago. And as Andrew noted, the BIS works with the Bank of England in orchestrating unified moves by this exclusive group of bankers who know ahead of time which way the gold markets will move. So what is going on now with the banks holding the unusual net long positions over the past 18 months? Andrew’s answer is that they have been gearing up for the accumulation of gold bullion to comply with Basel III. The fact that they can still play the wash-and-rinse game means that they can orchestrate large-scale smackdown days like they did on Thursday, March 28, just one day before Basel III goes into effect. The banks use the paper markets to orchestrate a dump of paper gold holdings to create a deceptively low gold price and then pick up physical gold in the over-the-counter markets from gold producers or others who are tricked into the concept the banker thieves require—namely, that gold is indeed a worthless barbaric relic. This leads me to another point that Andrew made, which is that some of the major gold miners are holding back their sale of physical gold at the same time that banks are building up their physical reserves. 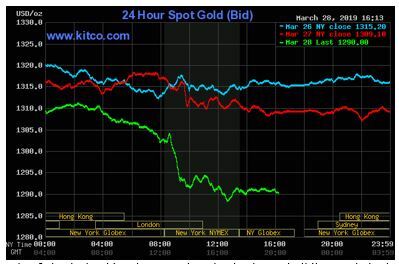 Andrew is an eternal optimist when it comes to an upside move for gold. He noted that the LBMA predicted a high price for gold of $1,532 this year and that Goldman Sachs suggested a price of $1,400. Andrew suggested they arrived at those numbers because they know very well that demand for physical gold will continue to be strong at the same time supply from the mines is in decline. A more skeptical investor might wonder if those bullish forecasts are not just a part of the rinse-and-wash game played by the establishment. Still, the pattern of rinse and wash suggests this smackdown just before BIS III rules go into place may have been a last gasp effort to grab as much honest money as possible by the banks even if by dishonest means. Moreover, the games played by the bankers in defiance of natural economic laws are putting on a huge death squeeze of economic prosperity that is bound to present a day of reckoning for those engaging in the sinful act of theft, which is by definition what bankers do with fiat money. That is one reason I like to depend on Michael Oliver’s momentum work. Not only has it been spot on, but Nature’s economic laws rinse and wash the Keynesian banking nonsense from the markets. Given Michael’s track record and a clear evidence that longer term momentum has clearly broken above the five-year downtrend, we are on to a major gold bull market, notwithstanding the dastardly manipulation of the downward price by the rinse and wash crowd.